With room for TVs up to 75 inches and an impressive look with a breakfront design with marble tiles, this TV stand is set to make impression on the decor of your entertainment space. 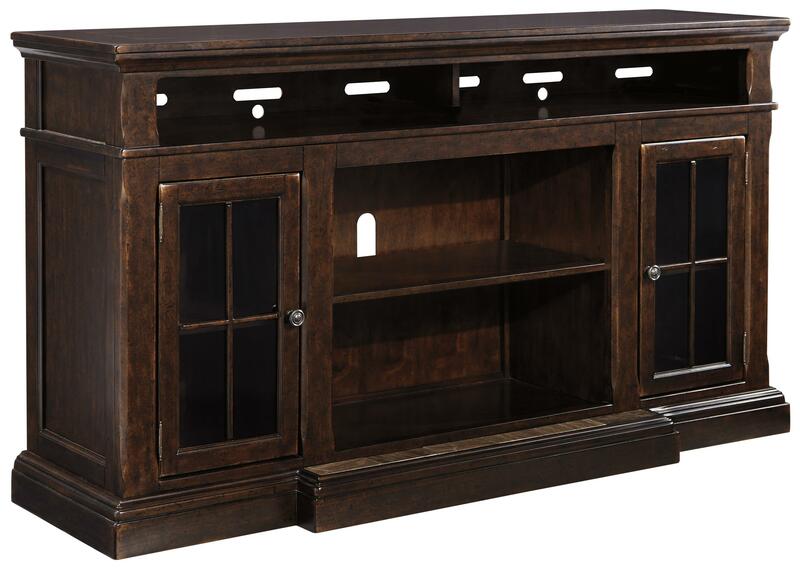 For relaxed style, the TV stand features a dark waxy brown finish over birch veneers and hardwood solids. The top compartment for electronics can even accommodate a sound bar. Two glass doors with wood panes and molding trim throughout elevate the style of this entertainment console. An optional electric fireplace insert is compatible with this TV stand. The Roddinton Extra Large TV Stand with Breakfront & 2 Glass Doors by Signature Design by Ashley at Michael's Furniture Warehouse in the San Fernando & Los Angeles area. Product availability may vary. Contact us for the most current availability on this product. Storage Wire management openings. Door opening (2) 12.00" x 16.00" x 23.75". Top opening 63.25" x 17.00" x 5.13". Shelf (2) 16.50" x 14.25" x 3.25"